The Primed Smooth panels have a semi-absorbent acid-free ground that is excellent for painting in oils, acrylics, water media and also for drawing. Consisting of top quality 1/8" MDF, these panels are coated with an acrylic gesso primer. 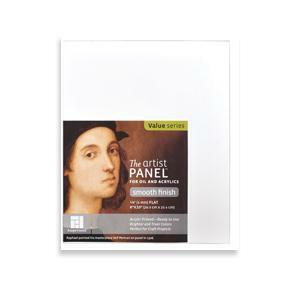 It’s perfectly suited for all painting mediums and for mounting papers, giclees and canvas. Use with standard framing or also frameless clips. good - Ampersand Value Smooth Panel 1/8" Deep 12"x12"